Segmovi (Servicio y Gestión de Movilidad de Vigo, S.L. ), founded in 2010, is the Official Segway Dealership for the province of Pontevedra and as such, we offer our services throughout the province. On a professional level, we offer our services to companies and organizations via hiring or purchasing Segways, as well as managing publicity campaigns and other events using this attractive, innovative and striking system of Intelligent Personal Transportation. 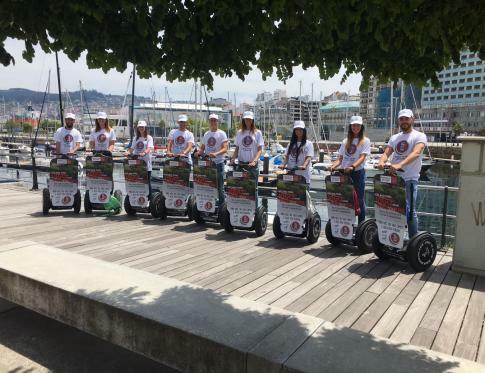 For leisure and tourism, we have designed the first Official Guided Segway Routes in the city of Vigo, blending culture and recreation, discovering all the different nooks and interesting spots of our city using this exclusive and fun means of transport. We invite you to visit our web page and discover how this means of transport will surprise you in many different ways. At quisque nisl tempus dolor donec hac habitasse commodo, elementum dui pharetra iaculis nisi ultrices sem rutrum, neque eu turpis sodales arcu vitae ut.